July 2015 – Set in a Gothic style mansion house surrounded by landscaped gardens, Mercure Bradford, Bankfield Hotel is a peaceful retreat on the banks of the River Aire and the perfect location for the wedding of Charlotte and Ben. The day started at the farm, filming all the guys getting ready before moving on to the hotel and catching the buzz of the guests arriving. 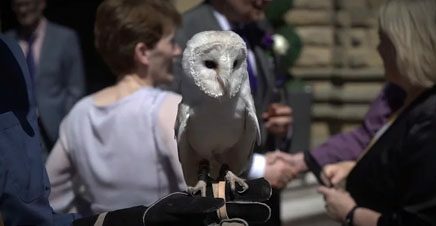 Rings delivered by an owl made this ceremony special and party went on well into the night. I’d like to thank Charlotte, Ben and their families and friends for making me feel welcome and allowing me to create a video of their special day at The Mercure Bankfield Hotel. As a solo wedding videographer, I can ensure your wedding day is filmed with the minimum of fuss or intrusion, yet using the latest professional video and audio equipment. I hope you enjoy this trailer from The Mercure Bankfield Hotel in Bingley, West Yorkshire.